Champions Celtic maintained their healthy lead at the top of the Scottish Premier League with a hard-fought victory over Neil Lennon’s Hibernian team. Leigh Griffiths was the matchwinner for the home side, although he limped off to be replaced by the dangerous Moussa Dembele soon after scoring the game’s only goal. The visitors worked hard to find a way through Celtic’s well-organised defensive shape in the second half, but to little genuine effect. Celtic lined up in a 3-4-3, shifting to 5-4-1 in the defensive phase – although at times in the second half they also employed a 4-4-2. Celtic’s first line of pressure ¬– Leigh Griffiths and Scott Sinclair, and then Moussa Dembele after he replaced Griffiths – made life difficult for Hibernian in their build-up. 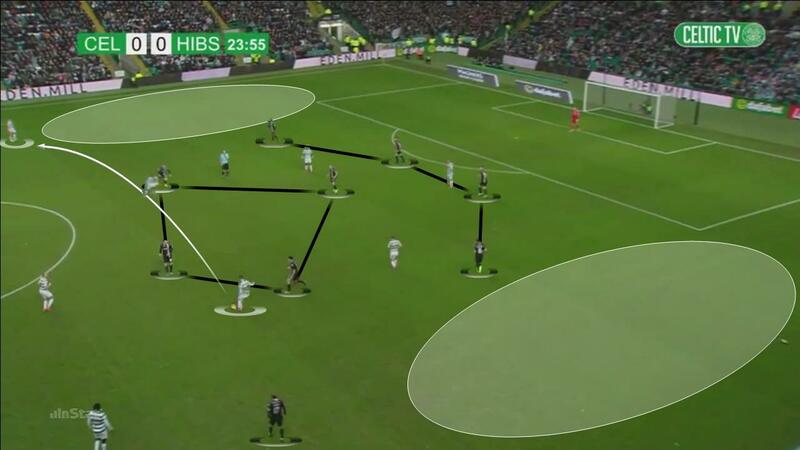 They tried to force Hibs’ attacks wide, preventing passes into central players, and constantly pressed the ball-carrier, with Scott Brown, Olivier Ntcham and Dembele particularly effective. Pushing Hibs wide did occasionally cause the Celtic defence problems in the final third, as they faced a number of crosses and in the second half left some gaps in their defensive live.  Maintaining numerical superiority in central areas limited the threat, however. 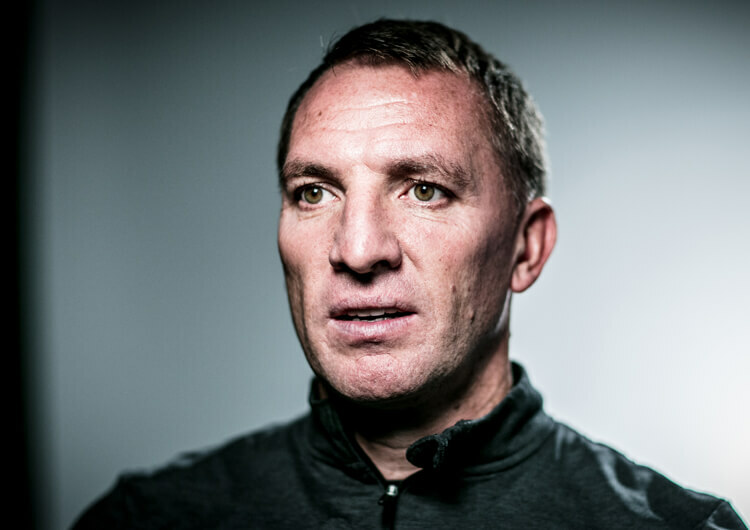 If the first line was not able to win the ball back or stop the counter-attack in the defensive transition, Brendan Rodgers’ team looked to get men behind the ball and slow the counter-attack – and, again, push Hibs wide as soon as possible. In attack, Celtic tried to play out from the back, through goalkeeper Craig Gordon (later replaced by Dorus de Vries) and centre-backs Dedryck Boyata, Jozo Simunovic and Kristoffer Ajer. 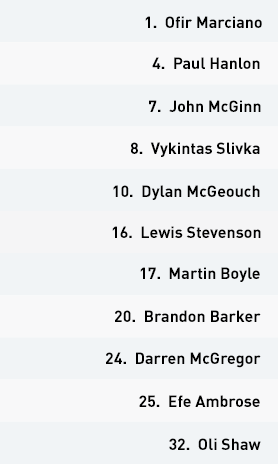 Central midfielders Scott Brown and Olivie Ntcham were always available, while wing-backs James Forrest and Kieran Tierney pushed forward into high positions. The pace and clever movement of Sinclair and Dembele in particular enabled them to find space in central positions high up the pitch – but they also enjoyed plenty of success in wide areas, where full-backs Lewis Stevenson and Efe Ambrose conceded space in behind. Celtic never stopped looking for runs in between and beyond the defensive line, especially following the introduction of Dembele. In the offensive transition, they looked to get the ball forward as quickly as possible, either to the strikers or a nearby teammate. Here, at least, the Hibs press was relatively effective. Celtic lined up in a 3-4-3, shifting to a 5-4-1, as here, in the defensive phase. On some occasions in the second half, they also changed to a 4-4-2. Crosses from the wings threatened the Celtic defence throughout. 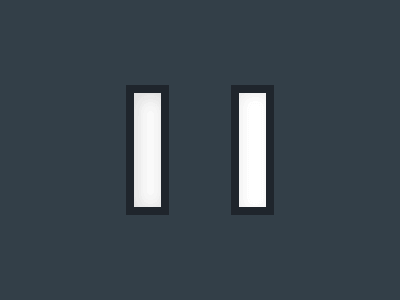 They looked to gain numerical superiority in defence so they wouldn’t be so exposed in wide areas. The Hibernian high press caused few problems for the first line of Celtic possession. 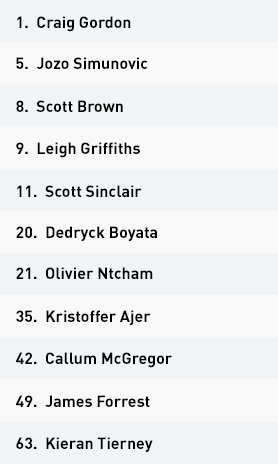 Scott Brown and Olivier Ntcham constantly offered themselves in the midfield, while the wing-backs always held high positions. 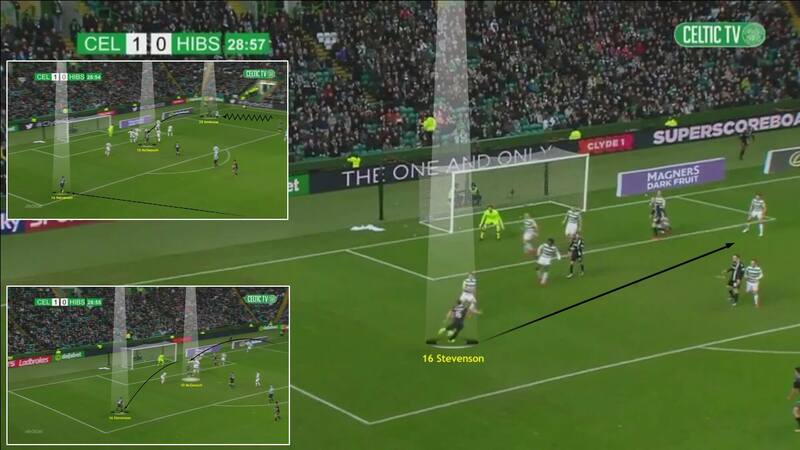 Celtic repeatedly found space wide in the final third and were able to put a number of dangerous crosses into the Hibs box. Here, Leigh Griffiths takes advantage of space in behind the full-back to score the decisive goal. Runs in between and beyond the Hibs defensive line were a threat for Celtic. 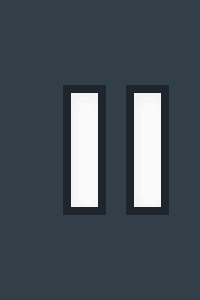 This became more evident following Moussa Dembele’s introduction and in the second half. 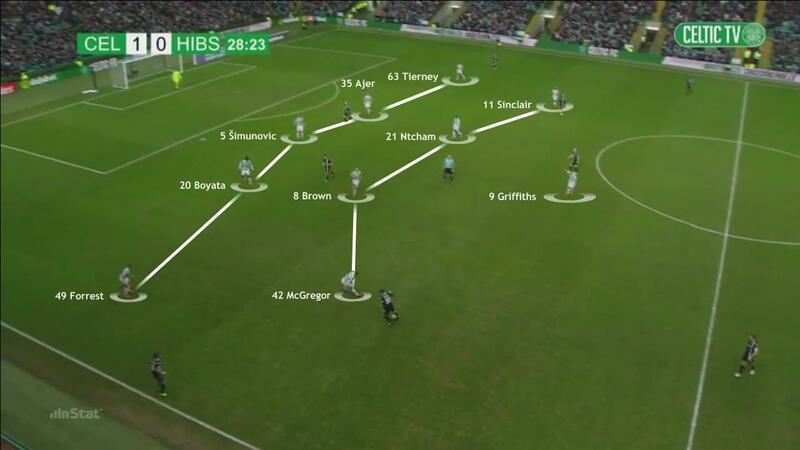 Hibernian lined up in a 4-4-2 diamond in possession, but this shifted into an orthodox 4-4-2 in the defensive phase. Despite being focused and co-ordinated in midfield, Hibs focused too much on preventing passes in central areas. 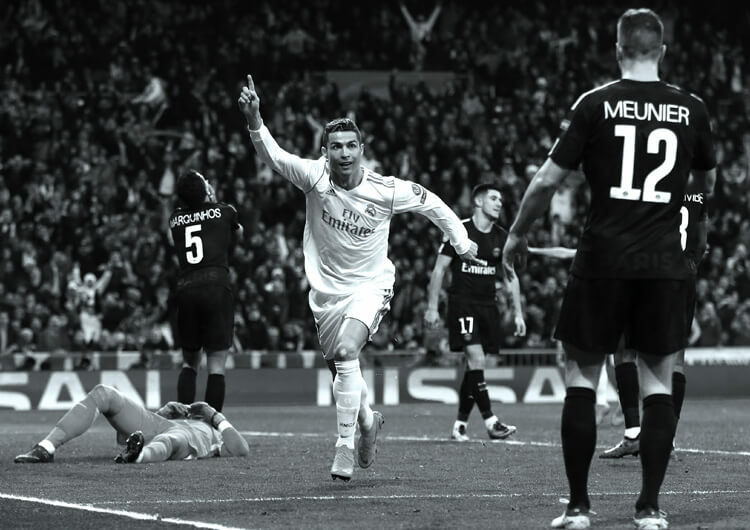 They ignored wide areas, which allowed their opponents to find space on the wings and build continuity in their play. They struggled defensively in wide areas – particularly at right-back, where Efe Ambrose was regularly exposed by Celtic’s swift combinations. Hibs found it difficult playing out from the back and failed to create opportunities from their first line. Celtic pressed well, forcing Hibs to look long to their forwards. Despite struggling to progress centrally, Hibs did find space out wide in the final third. This enabled them to put a number of crosses into the Celtic area, although none were converted. 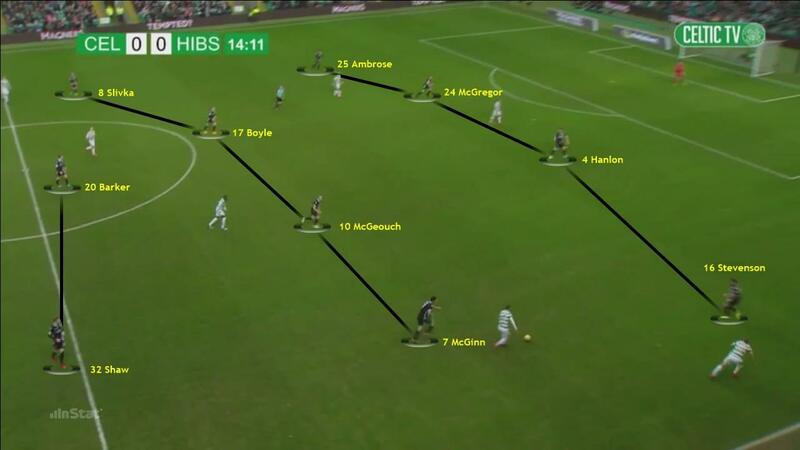 Hibernian lined up in a 4-4-2 diamond, shifting into an orthodox 4-4-2 in the defensive phase. Their first line of pressure – Oli Shaw and Martin Boyle – tried to direct Celtic’s build-up towards the wings and prevent them from playing into central players. 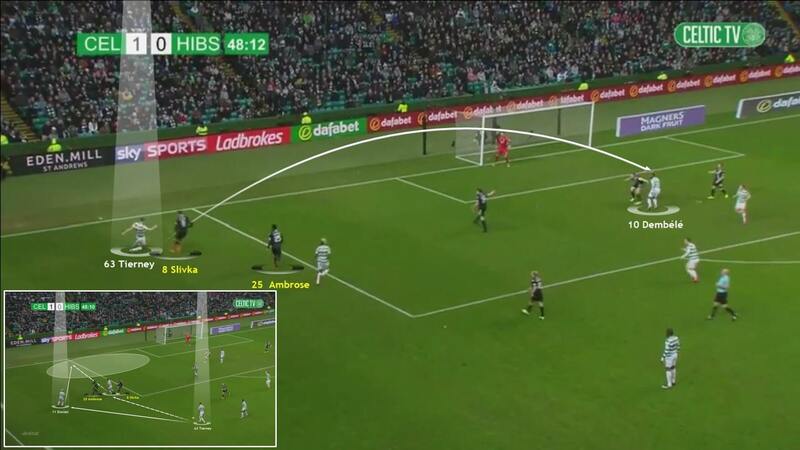 However, they struggled against a team that profited from the constant movement of Scott Sinclair and Moussa Dembele, and had persistent problems with crosses from out wide – particularly on their right side, from where the ball that led to Leigh Griffiths’ winner came. Centre-back Darren McGregor put in an excellent display, however – he was always ready and well-placed to cover or intercept when his teammates needed him. Hibs also had trouble in the defensive transition, due to the speed of a Celtic attack featuring Sinclair, Dembele, Callum McGregor and Kieran Tierney. With that in mind, they always tried to pressurise the ball-carrier as soon after losing possession as possible. In the offensive phase, their preferred option was to play out from the back – but Celtic pressed well and forced Hibs to play it long into strikers who won little in the air against the home centre-backs. With very little success against a compact and organised Celtic midfield, the visitors constantly had to look wide for a better chance of progression. This worked to a point, and more so when spaces appeared in the Celtic defensive lines in the second half, but despite working a good number of crossing opportunities they created few chances of real note. A direct approach on the counter-attack offered little threat. 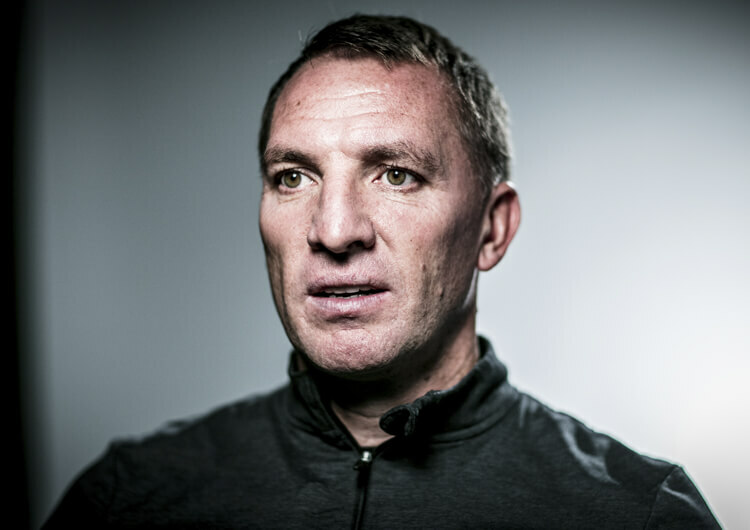 Celtic showed their versatility in their ability to change their attacking structure from 3-4-3 to 4-4-2 – and in defence from 5-4-1 to 4-4-2 – without showing any major imbalances in their game. Scott Sinclair had a great game. He constantly managed to take advantage of the central spaces that Hibs left, and worked hard to offer himself as a free man in attack at all times. Despite an early injury to goalscorer Leigh Griffiths, Celtic improved for the introduction of Moussa Dembele. He has great mobility, and his ability to find space in central areas meant he was a constant threat. Hibernian worked hard in the defensive phase, particularly to close off central spaces and prevent Celtic playing down the middle. They were also effective at pressing the man in possession when losing the ball. However, they struggled to deal with the Celtic attack in wide areas. Darren McGregor was excellent for Neil Lennon’s men. The centre-back was always available to cover for his teammates and intercepted numerous Celtic attacks.